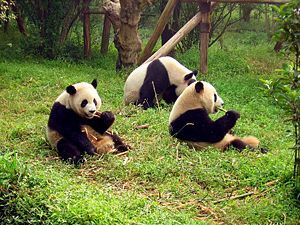 The Sichuan Giant Panda Sanctuaries (Simplified Chinese: 四川大熊猫栖息地; Traditional Chinese: 四川大熊貓棲息地; pinyin: Sìchuān Dàxióngmāo Qīxīdì), located in southwest Sichuan province of China, serves as the home to more than 30 percent of the world's highly endangered Giant Pandas. The sanctuary stands among the most important sites for the captive breeding of those pandas. 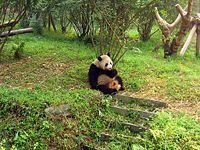 Covering 9245 km², the Sinchuan Giant Panda Sanctuary encompasses seven nature reserves and nine scenic parks in the Qionglai and Jiajin Mountains. Along with the Giant Panda, the sanctuary provides refuge to other endangered species such as the Red Panda, the Snow Leopard, and the Clouded Leopard. Sichuan Giant Panda Sanctuary hosts one of the richest botanical sites outside of the tropical rain forests, home to between 5,000 and 6,000 species of flora. The area has been compared to the paleo-tropic forests of the Tertiary Era. In 2006, UNESCO designated the Sichuan Giant Panda Sanctuaries a World Heritage Site. Approximately 1,600 Panda, a revered national symbol of China, live in the wild, most in Sichuan province. Approximately 30 percent of the Giant Panda population lives in Sichuan. In addition to the natural habitat well-suited to support the Pandas, the Chinese government has established the China Conservation and Research Center for the Giant Panda at Wolong for breading Panda in captivity. A massive earthquake, with an epicenter only fifteen miles from the sanctuary, damaged the natural habitat Panda's need to survive. One estimate has stated that as much as 80 percent of the natural habitat vital for the Panda's survival has been damaged. If that proves true, the fate of the Panda may lay in the balance. The Panda especially requires the bamboo grown in the region to survive. The People's Republic of China has decreed Wolong National Nature Reserve (Simplified Chinese: 卧龙自然保护区; Traditional Chinese: 臥龍自然保護區) located in Wenchuan County, Sichuan Province, a protected area. Established in 1963, the reserve covers an area of about 200,000 hectares, protecting over 4,000 recorded species in the reserve. Wolong National Nature Reserve houses more than 150 highly endangered giant pandas. In June 1980, the Chinese government established the China Conservation and Research Center for the Giant Panda at Wolong with the support of the World Wildlife Fund (WWF). As of 2007, researchers have conducted many breeding research on giant pandas and have successfully bred sixty six panda cubs. A mountain stream runs through the Wolong Valley, in which the Reserve lies. Boulders and small, rounded stones, abound in the stream that has a high alkaline content with pH levels measured at 8.91. Plentiful sand and uncontrolled gravel mining have resulted in the poor water quality and extreme turbidity of the stream. Dr. Jianguo Liu of Michigan State University, conducting research in 2001 research, concluded that the rate of degradation of the stream has increased since the creation of the Reserve. Liu's research team, using NASA's satellite images and records of population, concluded that due to tourism and the increase in local population has fostered an an unprecedented threat to the environment. "Tourists don't think they have an impact on panda habitat, but indirectly each visitor has some impact," Liu said. "We don't see ourselves as a destructive force, but we are." 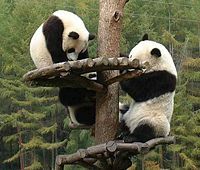 The region, including the Panda Research Center, was largely devastated on May 12, 2008, by a catastrophic earthquake, though the captive giant pandas have been reported safe. Initially, officials lost contact with the reserve. The People's Republic of China’s Foreign Ministry reported that a group of 31 British tourists visiting the Wolong panda reserve in the quake-hit area had returned safely and uninjured to the provincial capital. The well-being of an even greater number of pandas in the neighboring panda reserves remained unknown initially. Five security guards at the reserve died during the earthquake. Six pandas escaped from their damaged enclosures. By May 20, two pandas at the reserve had been found injured, while a search continued for another two adult pandas that went missing after the quake. As of May 28, 2008, one panda remained missing. Rescue teams later found the missing panda dead under the rubble of an enclosure. Sadly, nine-year-old Mao Mao, a mother of five at the breeding center, had been discovered on Monday, June 9, 2008, her body crushed by a wall in her enclosure. Panda keepers and other workers placed her remains in a small wooden crate and buried her outside the breeding center. The Sichuan Giant Panda Sanctuaries has nine scenic parks. They include Mount Qingcheng, which shares UNESCO's World Heritage Site designation with Dujiangyan Scenic Park. Giant Panda at Chengdu's Giant Panda Breeding Research Base. Chengdu Research Base of Giant Panda Breeding, or simply Chengdu Panda Base, located in Chengdu, Sichuan, People's Republic of China, serves as a non-profit research and breeding facility for Giant Pandas and other rare animals. Founded in 1987, the Chengdu Panda Base started with six giant pandas rescued from the wild. By 2007, the Center mid-wifed 110 panda births, and the captive panda population has grown to 62. With the stated goal to "be a world-class research facility, conservation education center, and international educational tourism destination, the Chengdu Panda Base has earned international acclaim. Giant Panda about one week old at Chengdu's Giant Panda Breeding Research Base. 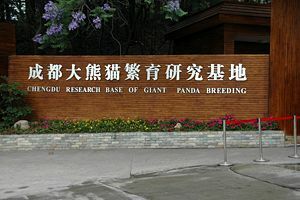 Chengdu Panda Base has partnered with numerous organizations to improving techniques for raising giant pandas in captivity. For example, its partnership with Zoo Atlanta helped the zoo secure the loan of two giant pandas. To date, those two giant pandas, Yang Yang and Lun Lun, have given birth to one off-spring at the zoo. ↑ 1.0 1.1 MSNBC, "80 percent of China's panda habitat damaged." Retrieved June 24, 2008. ↑ YouTube: Panda eating bamboo at Chengdu Panda Base Retrieved June 24, 2008. ↑ 3.0 3.1 Wolong Nature Reserve Retrieved June 24, 2008. ↑ Pandas International Retrieved June 24, 2008. ↑ Pandas 'safe' at park after quake Retrieved June 24, 2008. ↑ Report: "Rare giant pandas at Chinese breeding center safe after quake," International Herald (May 13, 2008) Retrieved June 24, 2008. ↑ Melinda Liu, "Animal Instinct," China Earthquake (May 21, 2008) Newsweek Retrieved June 24, 2008. ↑ "Two pandas missing in China quake region," UPI (May 20, 2008) Retrieved June 24, 2008. ↑ "Panda reserve mulls moving after quake damage," Associated Press (May 29, 2008) CNN Retrieved June 24, 2008. ↑ Yangtze Yan, "One panda confirmed dead in China quake," (June 10, 2008-06-10), Window of China, Xinhua News Agency Retrieved June 24, 2008. ↑ About Chengdu Panda Base Retrieved June 24, 2008. 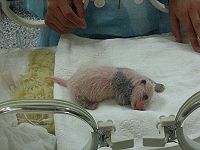 ↑ Zoo Atlanta's Conservation Education Initiative in China Retrieved June 24, 2008. ↑ Research partners Retrieved June 24, 2008. MSNBC: "80 percent of China's panda habitat damaged." History of "Sichuan Giant Panda Sanctuaries"
This page was last modified on 16 September 2015, at 20:52.